France joined African forces this week in an effort to oust Islamic militants in northern Mali. The militants have progressively moved south. 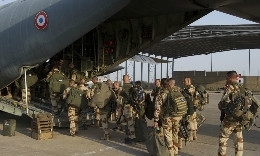 At the request of the Malian government, France earlier launched an air offensive against the militants. France is Mali's former colonial ruler. Then France launched a ground offensive, along with forces of Mali and the Economic Community of West African States, called ECOWAS. Islamic extremists seized control of northern Mali after Malian soldiers ousted the government last March. French troops have faced strong resistance from the Islamic force, said to be a well-organized coalition of militant groups. One of the Islamist groups leading the coalition is Ansar Dine, which means "Defenders of Faith." The group follows a form of Islam known as Salafism. It seeks to rule Mali under a severe form of Sharia law. Ansar Dine had joined with ethnic Tuareg rebels last April to oust government forces in northern Mali. In June, Ansar Dine turned its weapons against the lesser-armed Tuareg fighters and seized control of the area. Since taking over the north, the group has joined forces with two area militant groups. They are al-Qaida in the Islamic Maghreb and the Movement for Unity and Jihad in West Africa. The Islamists have used several methods to develop into a fighting force that surprised French officials with its skills. An expert at the Washington-based Foundation for the Defense of Democracies, Bill Roggio, said the militants secured their weapons from neighboring Libya. Mister Roggio also said the militants seized rocket launchers and armed vehicles from the Malian army. The militants have earned millions of dollars by kidnapping foreigners and taking part in the drug trade. In November the African Union approved plans for a West African military force to deploy to Mali. The plans were approved in December by the United Nations Security Council. France says 1,400 French soldiers were deployed to Mali. More than 1,000 more are expected in the next few days. Armed vehicles arrived earlier this week from Ivory Coast. On Thursday, 100 soldiers from Togo also arrived. The Togolese were the first of the West African forces to come to Mali. ECOWAS plans to send as many as 3,300 troops into the nation. Islamic militants made gains by capturing the southern and central towns of Diabaly and Konna. On Friday, the Malian army and French officials reported that Malian troops regained control of the town of Konna. The U.N. refugee agency says it expects up to 700,000 more people to flee their homes in Mali because of the fighting. Helene Caux, a spokeswoman for the U.N. refugee agency UNHCR in West Africa says she hears reports that many people are fleeing the conflict. "What we have at the moment are testimonies from people who are crossing to Burkina (Faso), to Niger, to Mauritania and what they are telling us is that more people are on their way. Actually, more people are on their way by foot." THE U.N. refugee agency says it is working hard to increase help for the growing numbers of refugees and people displaced inside the country. That would bring sufficient size for it to become the most important bond market in Europe, progressively reaching a liquidity comparable to that of US Treasuries. Where there is oppression there is resistance.